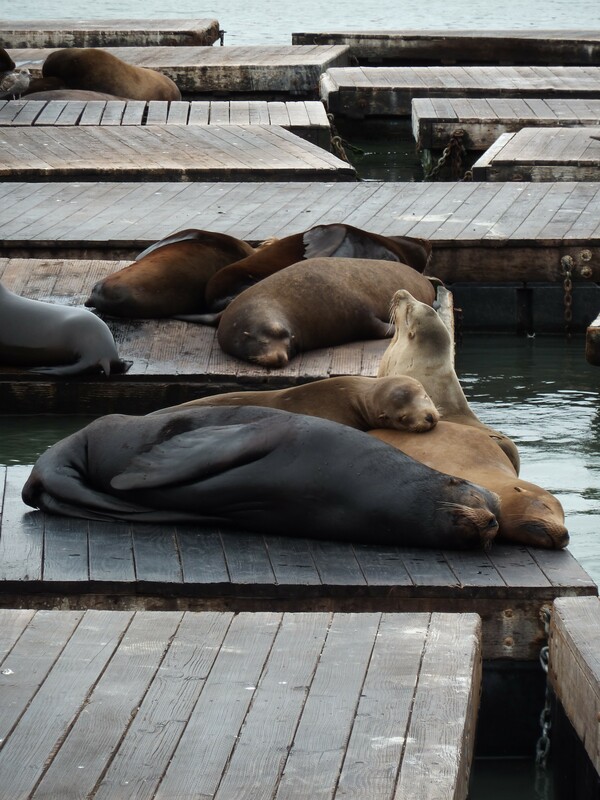 You may already have the feeling that we really like San Francisco. I have a sneaky feeling that my lovely husband has us here sussing out whether we’d like it enough to live here – there’s lots of work for engineers and he already has all the contacts… Anyway, it would not be a bad place to live at all. The sun seems to appear as if by magic every afternoon, even if it’s been cold and cloudy in the morning. The people are really friendly, and genuinely so, which is different from Houston in our experiences so far there. The food is great and you can find healthy and child-friendly food on all the menus (they don’t just presume that children will eat everything with fries!) The wine is good too, which is always a bonus. Most of the people are dressed ready for a yoga class or seem to have just come back or about to go jogging. If you’re under 40 then North Face clothing seems to be obligatory, at least in the trendier areas, and you also need to have a dog. I’ve never seen so many dogs in an urban area before. But they’re all well behaved and relaxed, a reflection of the people here I imagine. We’ve done a lot of walking the last few days. On Sunday I think we walked at least 8 miles. The Big One managed to walk the majority of that. The Little One was carried for probably half of it (it’s good exercise for my lovely husband and me – the food and wine here are so nice, we definitely need the extra exercise!) Before we had children, we always found walking to be the best way of getting to grips with a city. So, that’s what we did, albeit at a much slower speed than before. We had a good wander through some of the parks, walked down 377 steps, played on the beach and walked along the front past the marina, then along to China Town. By now it was early evening and the girls were exhausted. Finding space to eat Chinese in China town was difficult, and we’d had Chinese for lunch, so we headed back up to Chestnut and ate at A16, a brilliant Italian restaurant. The Little One was so tired that she fell asleep before the food arrived and didn’t wake up even when we undressed her for bed! The Big One was so ravenous she ate most of my pizza… Which, if you knew the Big One, you’d know that is only just a little short of a miracle. 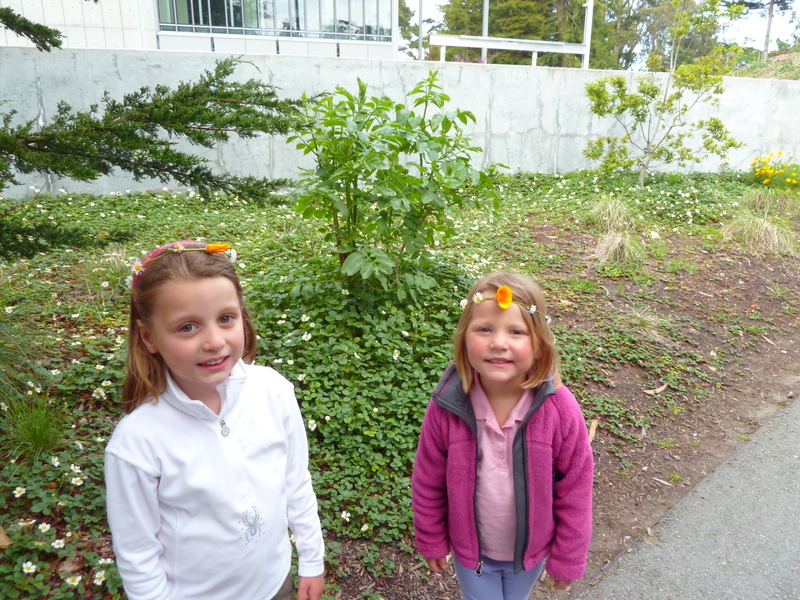 The girls were still tired the next morning (and I really ached from carrying the Little One so far) so we gave the walking a break and headed down to the California Academy of Sciences, which is an aquarium, rain forest, roof garden and planetarium all in one place. And it was truly amazing. First stop was feeding the penguins. The penguins live in an exhibit behind a glass wall at the end of one of the galleries which has recreations of animal habitats with stuffed animals (leopards lying in trees above your head etc) which were very realistic. Then you come to the penguins at the end of the room. We arrived just in time for feeding time and the scientist who looks after the penguins was telling lots of children about them. 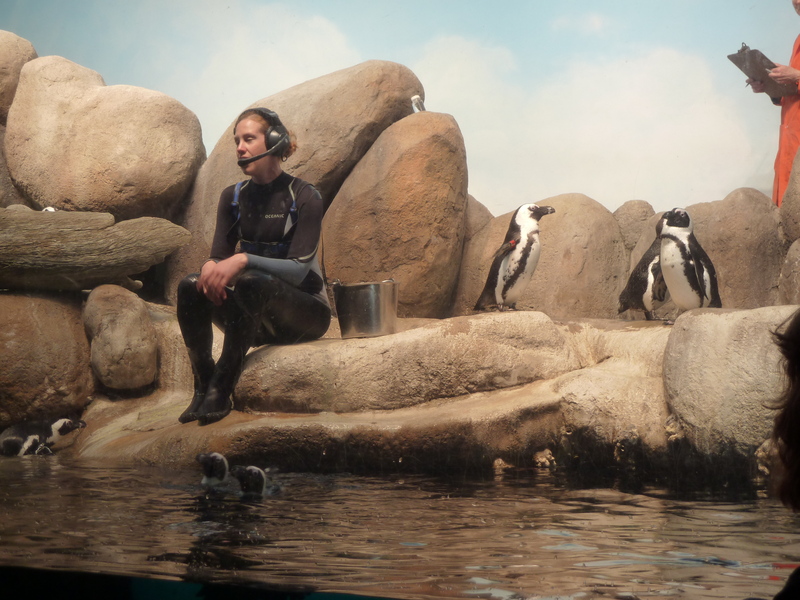 If you click on the link to the California Academy of Sciences you can find the penguins who have their own web cameras so you can watch them at any time. 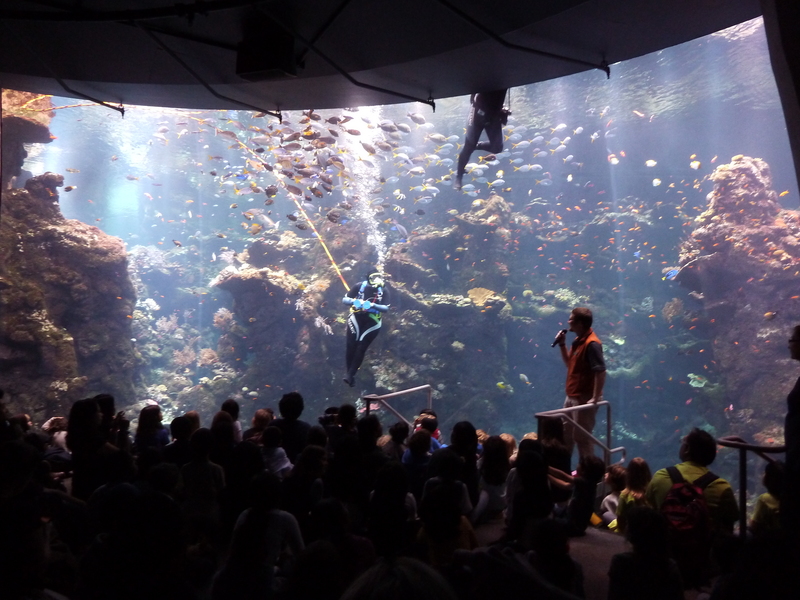 There were divers cleaning the tank and another diver giving a talk about the coral reef and the different fish who lived there. It was stunning and made me wish we had an enormous tank at home, rather than the tiny one with 7 little fish in! My lovely husband and I could have watched the tank (without the divers) for the rest of the day, there was so much to see. The girls preferred waving at the divers and giggling when they waved back! Hopefully the divers in the picture give you an idea of the scale of the whole thing. There were other aquarium exhibits, including a touch and feel tank where we felt star fish and other sea creatures native to California and saw some beautiful jelly fish floating around in a tank which changed colour – much better than a lava lamp for soothingness! We headed for the planetarium next for a show on how the universe was created and the potential for life on other planets. It was one of the most amazing things I’d ever seen. The girls were totally absorbed in it, particularly the Big One. The Little One thought the whole thing was real and was very concerned about how we were going to get home! After all this excitement, we headed to a park for the girls. There was promise of an old carousel but it was closed when we got there, but they were happy playing in the sand. We wandered back to see the Japanese garden for some peaceful tranquility. The girls found the Bonsai trees and the Japanese pagodas lovely but weren’t so impressed with Japanese cookies! The did get some fortune cookies though, which they like to break open even if they’re not that fussed about eating them. The next morning was a bit foggy so we wandered around the amazing food market in the Ferry Building (see previous post on the ice creams there). Apart from the aforementioned ice creams, we tried some American cheddar cheese at the Cowgirl Creamery which we actually liked. Hurrah! When we get home we can have a change from buying very expensive English cheddar. I also spotted some cheddar from Keen’s (a farmer I’d worked with a long time ago on a Knowledge Transfer Partnership project – a mention for Matthew there!) and had a lovely chat about how great his cheese was! that the carousel was banned and the Little One shouted about it all the way to the boat trip. 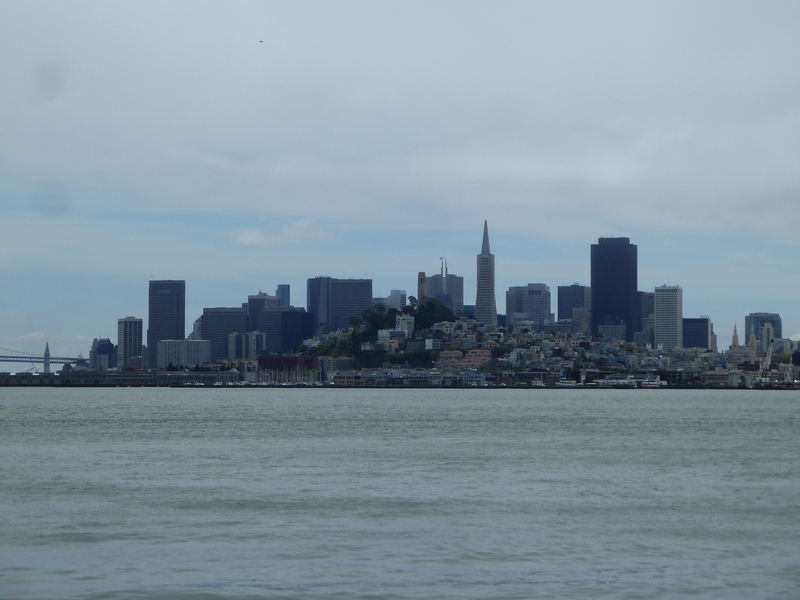 The boat took us out under the Golden Gate bridge, around the Bay and past Alcatraz. 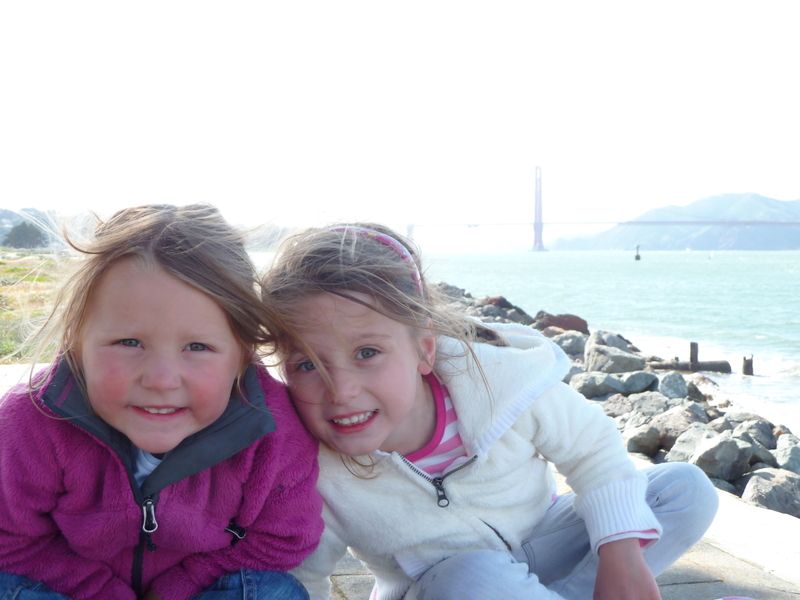 It gave us a fantastic view of the city and the bridge, which is truly enormous! It also gave us the chance to watch someone feeding the seagulls from his lunchbox which the girls didn’t like – they’re developing a dislike of birds flying near to them. He did get thanked in a very special way by the seagulls though, which the girls found highly amusing! Poo on the head is always funny, no matter how old you are. 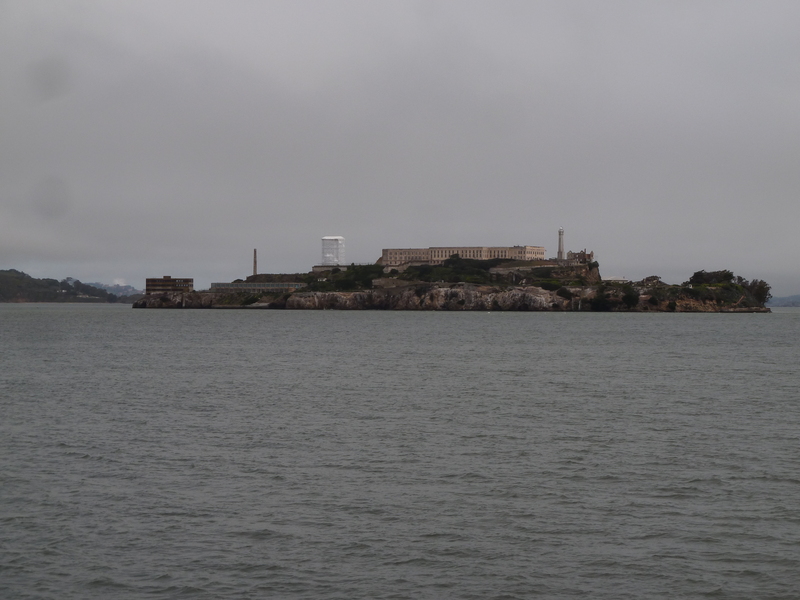 Here is Alcatraz. We didn’t visit the island as we didn’t think it would hold much in excitement for the girls but it doesn’t look a nice place to stay. Apparently only 3 people ever escaped and they don’t know whether they made it to the mainland or not. The water is pretty chilly and it was the first prison in the US to have heated showers so that the prisoners didn’t get acclimatised to the cold water! 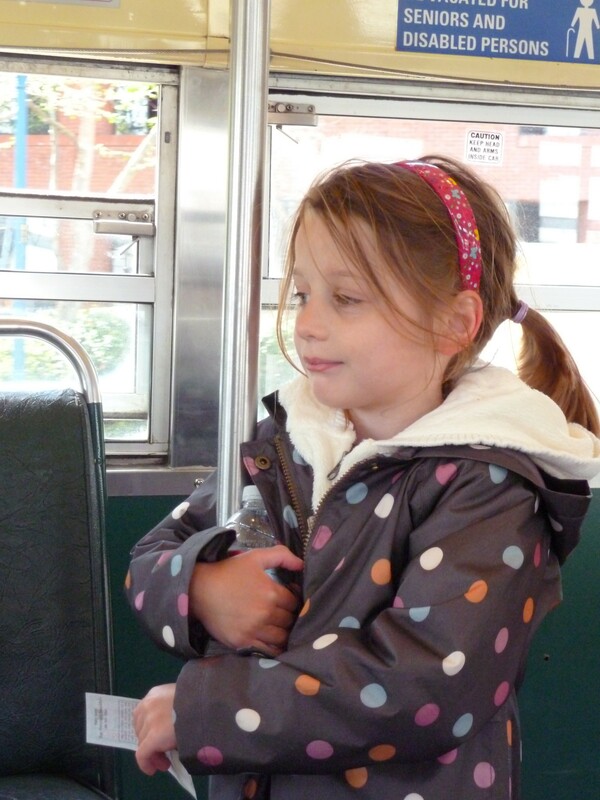 We took the cable car up the hill which the Little One loved as we were sitting near the front and she couldn’t wait to see what was at the top of each hill – more often than not it was just more hill. A great way to travel even if it wasn’t a whole load faster than walking. Much much easier than carrying the Little One though. « We love Hotel Drisco!